Duffields Cottage is a superb newly converted barn-style holiday home with two king-size en-suite bedrooms, ideally located in the heart of Brancaster village within walking distance of the stunning sandy beach . The cottage has a light and airy Scandinavian feel open plan living area with a vaulted ceiling and contemporary log burner. No expense has been spared to make this a perfect play to stay throughout the year for 1 or 2 couples or a family wishing to explore the delights of the North Norfolk coast, with the advantage of a professionally landscaped attractive fully enclosed, private front garden and off-street parking for one car. Duffields Cottage may be rented with Duffields House, a tastefully refurbished three-storey period Norfolk flint and brick house sleeping 8, to accommodate up to 12 guests. The cottage is accessed via the front garden gate and entry is into the stunning open plan living space with white-washed wooden floors, log burner and vaulted ceiling. This room incorporates the sitting area, kitchen and dining area and is a lovely sociable space for couples or a family. Kitchen area: newly fitted contemporary kitchen with all new appliances. There is a large fridge/freezer and fully integrated oven, dishwasher and washing machine. Dining area: has a white-washed table, two chairs and a bench seat to easily seat four people. Sitting area: has a contemporary log burner, new comfortable sofa, comfy chair, footstool and a wall-mounted flat-screen TV with DVD player and freeview satellite. There is a good selection of games, books and DVD's provided for your entertainment should you want to stay indoors. Bedroom 1: beautifully presented room with a new king-size bed with hand-made bespoke wardrobe and tallboy. The bedroom also has bedside tables, a chair and bedside lights with French doors leading to the garden. The other door in the bedroom leads to the en-suite bathroom which is a surprisingly large space incorporating a full size 'L' shape bath and shower, hand basin, heated towel rail and WC. Bedroom 2: beautifully presented king-size bedroom with chest of drawers, coat stand and bedside tables. This room leads to the second en-suite bathroom which is again newly installed with travertine tiles, a walk in shower, heated towel rail, hand basin and WC. The house is fully doubled glazed and fully insulated with intelligent electric central heating including heated towel rails and a log burner, which makes it very snug and warm in winter. There is a high chair and a travel cot available for use if required - please ask when booking. Duffields is accessed via a five-bar gate and a shared shingled driveway for the House and the Cottage, where there is one parking space for Duffields Cottage guests. There is a fully enclosed, private front garden, with patio door access from the main bedroom and front door. This has been landscaped by an award winning designer in 2017 with a coastal theme, providing a lovely sunny space with outside furniture, including sun loungers and barbecue in the summer months. The garden also has an outside 'store' for additional storage. Conveniently located near to the award winning Ship Hotel in the heart of Brancaster and within walking distance of the coastal path, Royal West Norfolk golf club and stunning sandy beach. For those not wishing to drive, there's the added advantage of the nearby Coasthopper bus-stop. Please note that short breaks (where available) can only be taken Friday to Monday (3 nights ) or Monday to Friday (4 nights) and are both charged at 80%.of the weeks full pricing. Very snug, comfortable and well equipped. A beautifully quiet spot.- Our thanks to all who thought and cared so much about it. We called into the Burnham Market Office to say "Thank You" and had a very warm reception there. Duffields Cottage is a complete package in itself. Lovely. 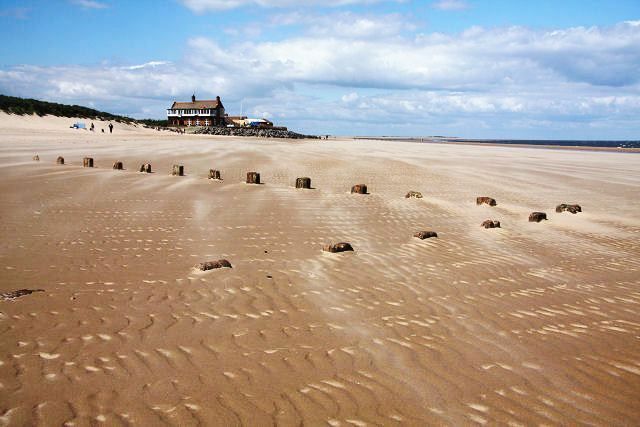 Brancaster is renowned for its wide expanse of sandy beach and has the advantage of being one of the few places along this stretch of the North Norfolk coastline that you can park the car less than 50m from the beach. This makes it a popular choice for families and as one of the driest parts of the UK it makes it an excellent choice for a traditional English seaside holiday. Throughout the year the beach is used by dog walkers, kite-surfers and bird-watchers, and in warmer climes by paddlers, swimmers and basking seals. For those needing more intellectual stimulus, at very low tides the remains of a petrified forest can be seen here. Brancaster was the site of the Roman fort of Branodonum, built to guard against raids by Frankish and Saxon pirates, although some local legends claim it was to counter Druids living nearby. All that is left of the fort now are a few ditches to the east of the village, and some Roman bricks in various cottages and outhouses. More recent history may be seen in St Mary's church, a Saxon building with a characteristic round tower nearly a thousand years old. The church has some beautiful medieval stained glass, and a fifteenth century bell cast in Kings Lynn. For the more energetic the National Trust runs Brancaster's Activity Centre, offering sailing, orienteering and kayaking for children and parents, and just outside there is the Royal North West Norfolk Golf Club which is one of the best courses in the area. The local pub The Ship has an excellent reputation as an award winning quality restaurant. Brancaster is conveniently located along the Coasthopper bus route, and has a small village shop selling grocery basics and newspapers. If you would like to see more of our holiday homes in and around the Norfolk coastal town of Brancaster, please click here.